Printable Pages with Kawaii Neko Yoko for Planning, Organising, and Writing. How to effectively plan and organise your day? Use a task or ToDo list. Plan your week ahead – at the end of the previous week. Start every day by looking through the list of top 3 or 5 things that you need to accomplish on the day. Once finished, tick them off. If you need to move a task to another day, mark it with an arrow or any other symbol that makes sense to you. Do you have various thoughts and ideas coming to your mind during the day? They might distract you. To stay focused, write them down on paper and continue with your current task. You can always come back to the ideas later and think them through in more detail. Why not to put your plans on paper and to write down your ideas on cute paper that makes you feel good? You get a kawaii cat writing paper (ruled), a cute small envelope for a romantic day or a special occasion, a polka dot pattern that you can use as a wrapping paper (just print on a large sheet of paper), coloured greeting cards and the same cards as a colour-in option (so you can colour them in as you want!). Print each page on an A4-sized paper, then cut as shown for the specific page. For the best results: for planning and writing sheets, use 100gsm paper (e.g. A4 Paper 100gsm); for greeting cards – 300gsm or more (e.g. Color Copy A4 Paper 300gsm). Open the PDF file. Select Print. Set “Page Size” to A4. Ideally, set page borders (margins / white space) to zero or to the least possible number your printer allows you set it to. “Scale” should be set to 100% or Fit, otherwise the finished (cut) page might be of the different size than expected. 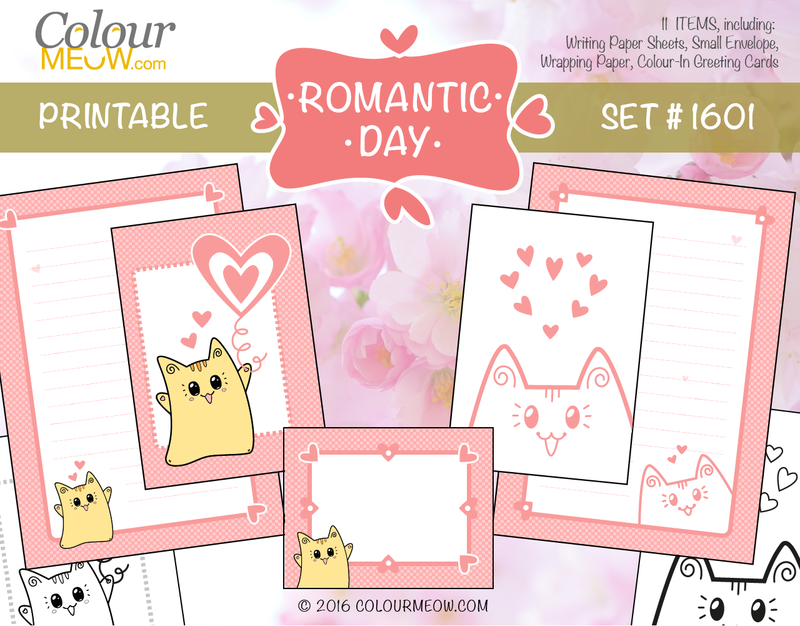 Colour Meow - DIY Printable Paper Set #1601 "Romantic Day". Neko Yoko Cat, Pink Polka Dot Pattern, Hearts . Use for Planning, Writing, Celebration, Diary, Journal, ToDo List. Includes 11 Ready-To-Print Pages: ~~ * 2 Small Writing Paper Sheets (A5: 14.8x21 cm or 5.8x8.3 inches) * 1 Large Writing Paper Spread (A4: 21x29.7 cm or 11.7x8.3 inches) * 2 Large Writing Paper Sheets (A4) * 1 Writing Paper Back / Folder Separator / Wrapping Paper (A4) * 1 Small Envelope (Fits A5 paper sheet folded twice) * 2 Greeting Cards (A6: 10.5x14.8 cm or 4.1x5.8 inches) * 2 Colour-In Greeting Cards (A6) ~~ You will receive one DIGITAL ready-to-print PDF file that includes all the above. How To Print: Print each page on an A4-sized paper, then cut as shown for the specific page. For the best results: for planning and writing sheets, use 100gsm paper; for greeting cards – 300gsm or more. Open the PDF file. Select Print. Set “Page Size” to A4. Ideally, set page borders (margins / white space) to zero or to the least possible number your printer allows you set it to. “Scale” should be set to 100% or Fit, otherwise the finished (cut) page might be of the different size than expected.